For a guy who has never played a snap in a college football game, Tate Martell has a surprisingly long and eventful history in the sport. He started receiving Division 1 scholarship offers in middle school, and first committed to a Power 5 program in eighth grade, pledging his services to the Washington Huskies. He decommitted from UW, then spent about nine months as a Texas A&M commit, before finally deciding on Ohio State. He was named a second-team all-American following his sophomore year of high school, behind only future UCLA standout Josh Rosen and Washington star Jake Browning. Browning is now heading into his fourth year as the Huskies’ starter with more than 9,000 collegiate passing yards and 78 touchdowns to his name, and Rosen is about a month away from being selected near the top of the NFL Draft. Martell has nearly 90,000 Twitter followers, and a Google News search for “Tate Martell” returns more than 6,000 articles. It’s a little strange that a guy who has been part of the national college football conversation for close to six years could still be waiting to see his first real action. For Martell, it’s just exciting to finally have a chance to prove that he’s worth all that hype. Tate Martell practicing before the 2017 Cotton Bowl. 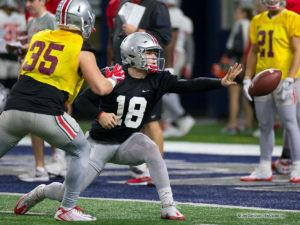 The redshirt freshman spent a lot of time on the practice field in the fall of 2017, drawing glowing reviews from Buckeye coaches and defensive players for his work on the scout team. Several times during the fall, older OSU players mentioned his elusiveness and playmaking ability. While he came to Ohio State to win the starting quarterback job, Martell admits he really wasn’t ready for it last fall. Now, with a year of experience under his belt, that has all changed. “I actually know what I’m doing out there now instead of just using straight athletic ability out there,” he said. “I know all my checks now. I can go through and check any play. 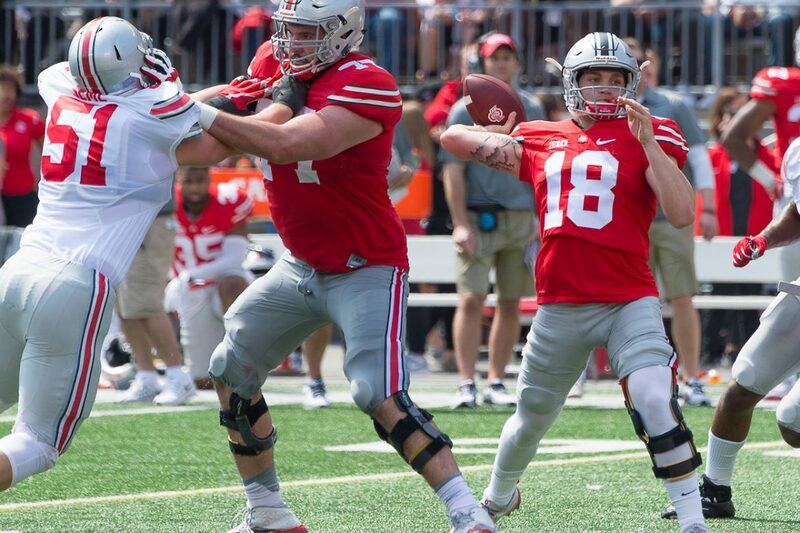 The three weeks leading up to the Spring Game on April 14 could play a big role in deciding not only whether Martell, Joe Burrow, or Dwayne Haskins takes the first snaps of the season, but just how far the 2018 Buckeyes could go. I will have to see it to believe it with Tate. And I hope he turns out to be Doug Flutie 2.0…but man, that is a tall order. And if they run him on 20 to 30 QB Power Dive per game he really stands no chance (as he would never make it through a season). Look at what came of Braxton and JT…both basically left OSU as the walking wounded. And they were way bigger than Tate. Under the Meyer QB Power Dive offense Tate would be lucky to leave here walking. Never forget, ONE (1) week after knee surgery J.T. had 20+ designed power rushes in the B1G Championship. Good luck Tate. For what it’s worth, JTB had 19 rushes in the Big Ten Championship Game. Ten of them were called QB runs. I would have to check the tape on that Gerd…I think it was 20. But nonetheless, even taking your numbers that is still insane! And let us never forget JT leaves OSU No. 3 in all time RUSHING ATTEMPTS!!! So my point remains the same… God bless Tate trying to be the power runner this offense asks the QB to be. Hopefully we move off of that offensive concept as it really doesn’t fit any of the QBs on our roster. The called QB runs were due to 1) being backed up in their own end zone; 2) the need for short-yardage gains; and 3) the game got close at the end and you know how that goes for Urban Meyer. The key is to blow more teams out. LOL. The fact that Martell talks about a natty with sports writers says a lot about his competitive spirit. Even at under 6 feet tall, he will elevate the entire team, one day.